Boracay Island had always been a dreamy escape, and I'm sure many would attest to that. Without a doubt, beachcombers take Boracay as a place of many interests, including food escapades. For sure, nothing competes for a beach vibe without having the famous mango shake, or the infamous calamansi muffin and a copious serving of seafood, of course. A food crawl in Boracay can also be a matter of interest but time-management can be at risk, especially if you're only on the island for the weekend, which was our case when we last visited before August ended. With that said, still, our food experience had been nothing short of amazing, even though we didn't go beachcombing for island grubs and bar drinks. Well, why would we do that when Coast Boracay have Cha Cha's Beach Cafe. 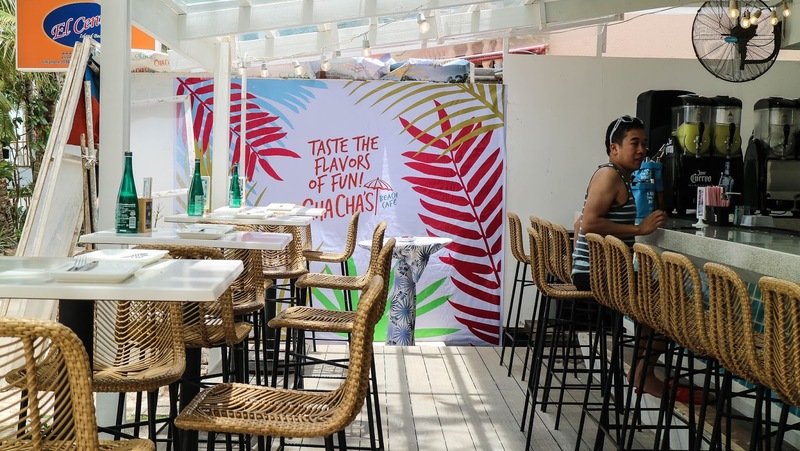 Cha Cha's is Raintree Restaurants' newest F and B outlet serving both Coast's guests and walk-ins. It definitely has that same vibe that Boracay gives forth. But it all still boils down to having a delightful feat. Cha Cha is one of the best reason why we chose to stay at Coast Boracay. Next to the exemplary service, you get from Coast's staff is Cha Cha's saying "we got you and your appetite. If it's booze you're after, that's covered too!" From the al fresco dining to the beachfront, their menu will get you through a sizzling spell of weather or the worst hangover. Speaking of hangover, they serve the best cup of coffee, in a variety of ways and plays. I mean, have you ever grated a cinnamon stick over your coffee or added "tsoknut" to sweeten it up. 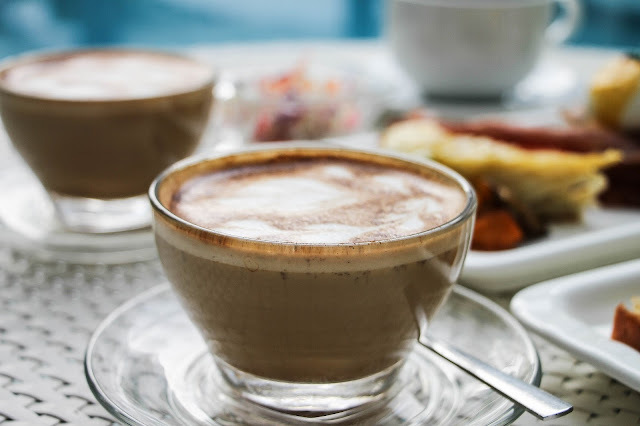 Coffee aficionados would love the idea of a tray served with your choice of coffee, which had different sweeteners and creamers and what not, plus the cutest grater ever. 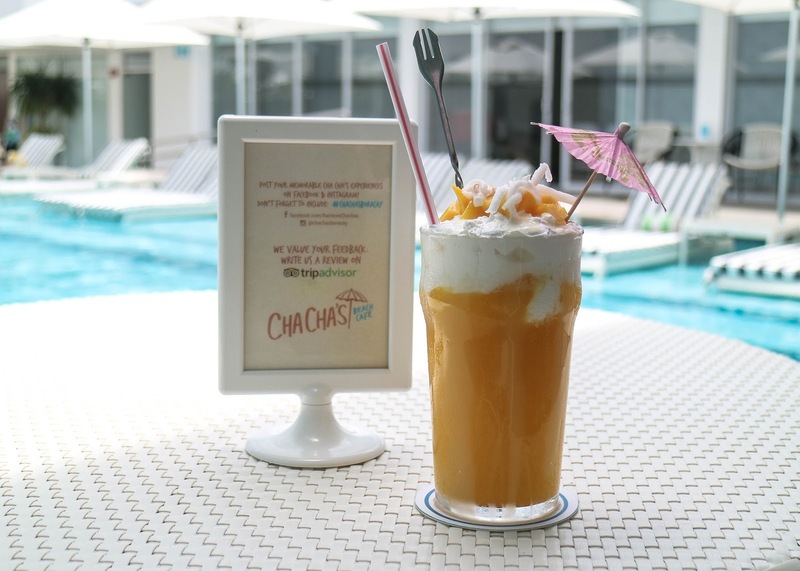 The guests are going gaga over their best-seller healthy shakes, such as this mango shake. 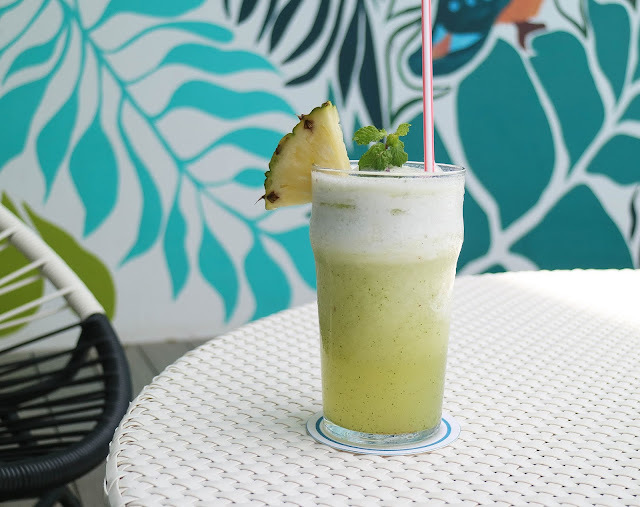 Another refreshing drink you'd want to have while wallowing time away by the pool is this mix of pineapple and mint. I'm just giving you a quick reference to my favorites here that you won't find anywhere in Boracay. Take for instance the ube taho (served only during breakfast), the only thing I had for brunch after arriving like a lady boss on a speedboat. OMG! Nowhere in the world (perhaps) can you find an ube (purple yam) taho. Now, I'm re-evaluating everything after having ube pancake from one of Raintree's cafe in Manila, Chelsea Kitchen. Now, is ube their signature buzzword? Well, I don't give a damn, I love it. And might I say ube never gets out of trend while foodies like me are still around. Cause yeah! This bowl of ube champorado topped with dilis is just winging it more. Every spoonful of the warm, thick and creamy porridge tinted a little over lavender color reminded me of my grandma, who used to make us ube halaya from freshly grated ube and kamoteng-kahoy. The creamed coconut milk added more richness to it while the dilis added that oomph as it gave the perfect balance between sweetness and saltiness, or what food critics call "the bliss point." Cause yes this is bliss upon bliss. That's how I'm going to sum up my breakfast at Cha Cha's. Would you dare to disagree! So what else, can I say about their breakfast buffet? The spread which actually comes as a complementary to the hotel guest costs about P 550 to the walk-ins, which seemed to be competitively-priced has the makings of a dreamy breakfast. If you're the kind of person who loves to wake up and eat rice together with meaty and saucy dishes, then this joint is for you. If you're the healthy one or even a vegan eater, this is also for you, as they have granolas, Greek yogurts and overnight oats which you can mix with fresh fruit slices. You can make your own salad too according to your whim. For the "sosyal" breakfast-eater who has a particular recipe for omelet, or those heavy on pancakes, waffles, bacon and typical wake-up meals, Cha Cha has more than enough of those. However, if you're that kind of person who loves pizza for breakfast, doughnuts, scones and other pastries or even a cocktail drink with it (now's the time to say YES!) this joint is definitely for you. This Beer-battered Fish and Chips is one of my husband's favorite which made sense coming over Boracay for some seafood and beer. Their ala carte menu which is available all through the day is a curated mix of cuisines which have been given a new light by Raintree's head chef, Kalel Chan. The comforts have given by our room and our bed, plus the Netflix was not enough to lure us away from dinner. The Cold Spicy Salmon and Tuna Poke Bowl took me to Hawaii (conforming with the beachy performance from Artstrong) from a moment. I'm not fond of beers (boo! ), but this pizza is the perf companion of the latter. I love this pizza as it is both a salad and a pizza topped with chicken and seasoned with sriracha and aioli. So, I paired it with a cocktail. Opulent Asian dishes also stand out and have proved to be crowd-favorite. Have any on you missed the Sinigang sa Watermelon over at the defunct Simple Lang? I do! But this huge bowl of Seafood Sinigang sa Guava truly made up for it. Most of their dishes, btw, are served hefty so depending on one's appetite, the dishes can be shared though. Cha-cha's have it, but like what I've been saying, the creative chefs made it possible to make their dishes stand out, be noticed and enjoyed, hence, a total make-over to the traditional dishes we're accustomed to. So don't be surprised when you ask for Halo-halo and an iron skillet is served on your table with a pastry on it. It's Cha Cha's Halo Halo Crumble. A warm crumble that encases all the halo-halo ingredients floating on coconut cream and is capped with ube ice cream and leche flan square. Another thing you should not miss, especially the sweet-toothed, is the Mango Tres Leches. I's their take on Mango Sago + Tres Leches. All in all, this really delivers a great mouth-feel. There was a time when we just wouldn't want to go out but craved for some nibbles, even though our room is just a short walk from the cafe, but Coast has a way of over-indulging their guests. Thus, future guests, take note of Cha Cha's button at the phone. One touch of it and your hunger pangs are solved and ordering is so easy as a copy of the menu is right at the office desk. So there, being catered by Cha Cha's Beach Cafe is like being treated like a don and doña, take it from me, but of course, the way you want to be treated can also vary in the way you treat others too. The staff's kindness and the chefs' MasterChef-like abilities are what Cha Cha's Beach Cafe promise to deliver homogenously, with the vibe that sets the tone for fun dining.